Digital marketing has drastically evolved in recent years, since more and more cutting-edge technologies and eCommerce platforms emerge to contribute to your online business optimization. Nowadays we regularly come across brand new trends, innovative approaches and challenges. When applied to digital marketing methodology they enable companies to renovate their overall business strategy and improve performance. Quite obviously why there are so many analytic firms and agencies collecting data to measure KPIs and singling out the most effective marketing techniques. 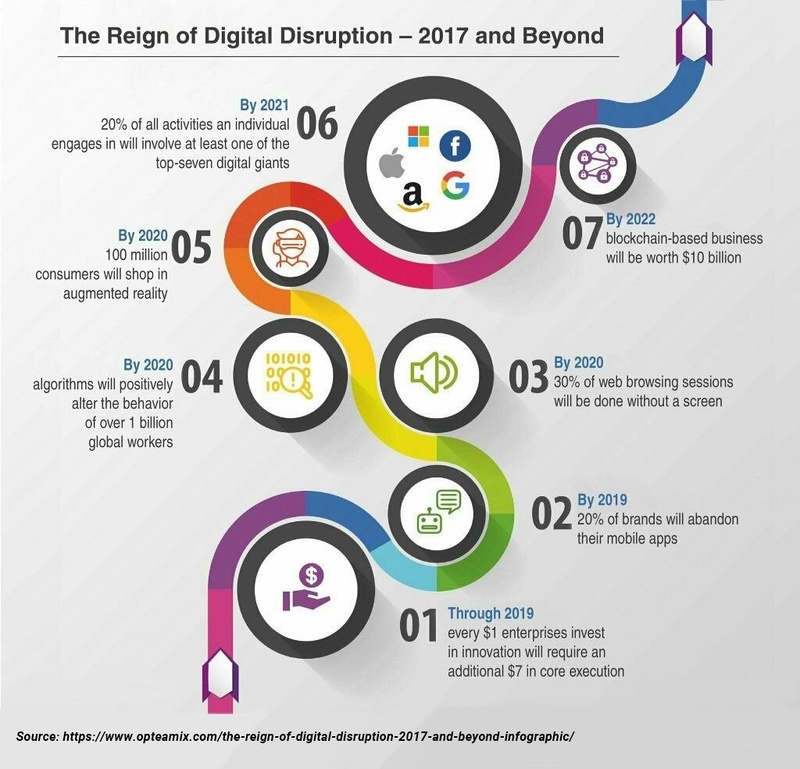 All these reports and surveys prove that disruptive innovations are great in number and digital marketing has to acquire a plethora of up-to-date instruments for streamlining the online business processes. Digital marketing itself has transmuted into an indispensable mechanism for effectively expanding your brand presence and reach in no time. It is by far the most efficient and handy means of engaging the target audience and deliver them your brand value all around the globe. The customers in their turn are evolving as well and require unconventional marketing solutions to get attracted. The very essence of digital marketing remains the same – to engage and retain more audience in terms of both quality and quantity. Customer experience (CX) is finally gaining the attention it deserves, with 84% of companies seeing CX as a higher priority than they did two years ago. With new trends in mind, business owners must look for seasoned marketing experts who can implement tech-enabled methodology throughout all the stages of customer journey. It helps your eCommerce project drive more traffic, increase conversion rates and improve the top-line growth of the company. 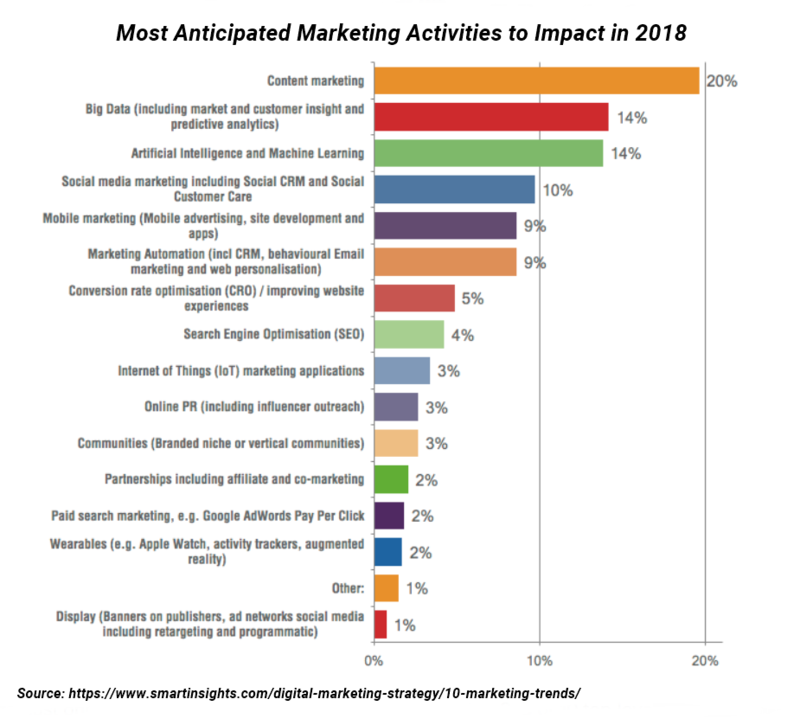 Here we have gathered several trends that will demonstrate the most significant impact on eCommerce marketing processes in 2018. Native Mobile Apps. Mobile apps can initiate a browser instance in-app, Facebook, for instance, or make Chrome open a new browser window as it is done in Instagram, with the URL in question in the browser. Both variants are alright and the browser itself goes directly to the site and therefore looking like direct traffic when viewed in Google Analytics. Email. Big time email providers like Gmail, Yahoo, and Outlook don’t pass a referrer when a user clicks the link to protect privacy and security for that user. Chat. It can be done via chat-based native mobile apps like WhatsApp, Facebook Messenger, WeChat or web and desktop based chats like Google Hangouts, IRC or Slack. Chat users of any kind pass the referrers neither! Secure browsing. If you browse on a site using HTTPS and click a link to a site that uses HTTP, a referrer won’t be passed. Organic search. In some browser configurations, Google will not in fact pass a referrer if a customer clicks on a link from an organic search. It is just impossible not to pay attention to dark social in 2018, since it is reported to be responsible for 84 percent of outbound sharing. Supercharged by means of mobile and messaging channels, it is playing a very important role – and it is crucial to realize it. If social traffic is only tracked with the help of conventional web analytics, an online business may significantly underreport and mistakenly measure the value that social media adds to your brand. RadiumOne’s recent survey indicates that 46% of customers aged 55 and older share via dark social only, compared to those aged 16 to 34, where only 19% do so. Dark social gives a promising chance for all online businesses in 2018 to double down on the abovementioned channels that surely help reach wider and more qualified target audience and broaden company presence on the market. The recent Google report has revealed that 96% of smartphone users turn to their mobile devices to get the things done when it comes to the search of products and services they need. To prevail in the upcoming year, businesses will have to predict customers’ expectations and make use of these micro-moments to timely offer them relevant product information. So the key of micro-moment marketing is to grasp the idea that you have only a few seconds to seize the attention of your target audience. During these very moments, brands strive to provide a meaningful message that hits the bullseye of their customers’ interests. If this tactics fails, prospects will just go by paying no attention to the things you are about to offer. The contribution of video content in the upcoming 2018 is by all means invaluable. HubSpot stats say that 43% of customers want to see much more video content from marketers. Consequently, 48% of marketers plan to add YouTube to their content strategy in 2018. When the younger generation with a wide scope of video-enabled gadgets and devices come into play in 2018, video marketing tools will demonstrate high efficiency in promoting businesses and their products or services across various channels. The only thing companies should do is to measure the productivity of different channels so that the right audience can be targeted in the right place and at the right time. In 2018, delivering a personalized online experience will be crucial since customers require more from businesses and try to avoid the misleading info while buying the products and services they want. For example, in case with standard, non-personalized emails, the open rate is only 15.03% and only 1.13% clicked on the link inside, whilst personalized emails, with content relevant to the user, the open rate is 56.43% and the rate for opening the link is 31.13%. During last few years, online businesses have aligned the power of customer centricity with their email marketing strategies, utilising automation processes to analyze buyers’ preferences based on their behavior, interests, age and gender. Today’s B2B and B2C consumers expect even more personalized experience across all touchpoints in their customer journey. Around 66% of consumers are inclined to change brands if they feel being treated not like persons but figures. All these trends indicate that improving customer experience leads directly to steadfast brand loyalty. Chatbots are definitely in the top 2018 marketing tendencies that are able to contribute immensely to digital success of both B2C and B2B eCommerce projects. To know more about their role and functions in eCommerce, please read our previous article. By 2019, 40% of all digital transformation initiatives will be supported by cognitive/AI capabilities. Business Insider reports that 80% of companies already use or plan to utilize chatbots by 2020. That’s all for now about the upcoming 2018 marketing trends. Should you feel like getting more information concerning advantageous tendencies on marketing landscape, do not hesitate to contact us right away.